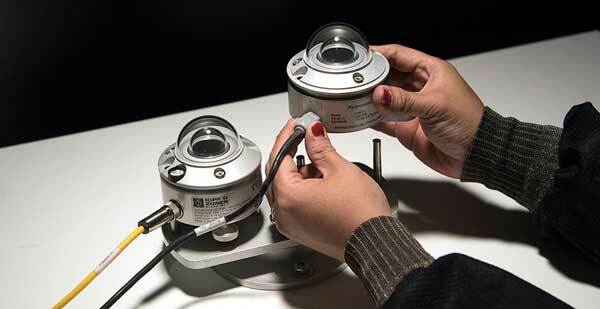 Introducing secondary standard, first class, and second class pyranometer calibration services from Apogee Instruments. Our new indoor thermopile pyranometer calibration service complies with the ISO 9847 type llc calibration procedure and includes a calibration certificate showing the procedure, traceability, and calibration factor. View example calibration certificate >. While most manufacturers recommend pyranometers be recalibrated every two years, you may wish to wait longer depending on your particular requirements. For a simple method to check if recalibration of your pyranometer is necessary, visit the Apogee Clear Sky Calculator >. Calibration method is performed by our highly trained technicians and complies with type IIC of the international standard ISO 9847. Most calibrations completed within three days of arrival. Apogee can complete other repairs and maintenance including cleaning, basic cable repair, and desiccant replacement in some models. Call for details. For questions, please call Apogee Tech Support at (435) 792-4700 M-F 8:00 AM – 5:00 PM MDT. To send your sensor in for recalibration, please fill out the form below and one of our technicians will contact you with further instructions and a detailed quote. If the form does not show below, you can click here to view the RMA form >. One of our support specialists will respond as soon as possible during business hours which are M-F 8AM - 5PM MST.